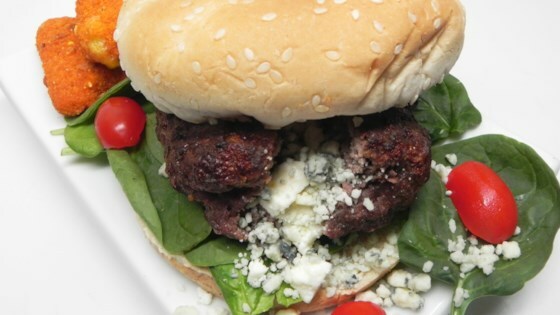 "It's a burger stuffed with feta and Gorgonzola cheese. I made this recipe for my hubby and friends, and it was a hit. Now they're the only burgers we eat. To make this kid-friendly I also stuff the burgers with two slices of aged Swiss cheese. Yum! They will come out square - the kids really like that." Line a baking sheet with plastic wrap. Combine beef, garlic, Italian seasoning, dill, salt, and pepper in a bowl. Mix by hand until sticky and fully combined. Form beef mixture into balls; sprinkle with some water to tighten. Flatten into large, thin patties. Mix feta cheese and Gorgonzola cheese together in a bowl. Spoon cheese mixture over the patties. Fold in the edges of the patties to seal the cheese in using wet hands. Place on the baking sheet and refrigerate until firmed, about 30 minutes. Heat a large skillet over medium heat. Cook patties until no longer pink in the center, 7 to 8 minutes per side. An instant-read thermometer inserted into the center should read at least 160 degrees F (70 degrees C). What's cooking in South Jersey? The Messy Cook's tropical burgers.